WAWELOVE spacious 3 bedroom apt 1 min to Main Sqare! Family apartment full of various souvenirs. WaweLove Apartment is located in the heart of the Old Town, on one of its oldest streets, a short walk from Krakow's market and numerous tourist attractions. We have prepared the apartment with great care, complementing it with comfortable solutions that our guests expect. We will be glad to host you in our house - we warmly welcome you! 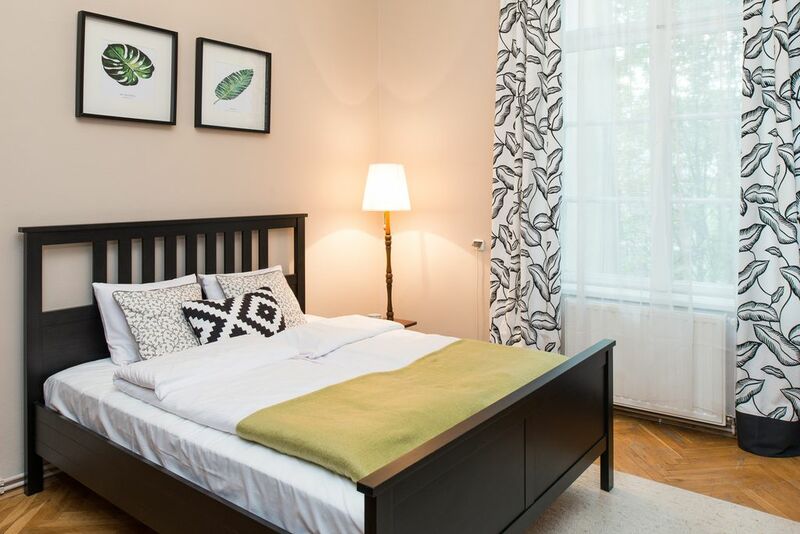 Bright and cozy apartment for 6 people (2 + 2 + 2) located on the second floor of a historic townhouse on one side, overlooking the quiet green courtyard of the Old Town and the Royal Route leading to the Wawel Castle on the other. The apartment has two bedrooms with a large double bed (160x200), a living room with a comfortable sofa bed (160x200) and a dining area, a fully equipped kitchen, a bathroom with bath and shower, and a separate toilet. The total area of 86 m2. Fully equipped kitchen: fridge, stove, microwave, kettle, coffee maker and coffee maker. For guests use glasses, plates, pots and pans, as well as coffee, tea, sugar and spices. Bathroom with bath and shower, washing machine and hairdryer and towels. There is also an ironing board and an iron in the apartment. PRICE INCLUDES: towels, bedding, internet and all charges. email and telephone contact during your stay: we help and advise on solving current problems, organizing guided city tours, guided tours to Auschwitz-Birkenau and Wieliczka Salt Mine, as well as advising on restaurant selection. The apartment is located on the high 2nd floor of a historic building WITHOUT ELEVATOR. Secure car park at a distance of 50 m from the apartment. Delicatessen 24/7 is located on the ground floor of the building. I grew up in an apartment where we would like to host you. It's my neighborhood, once my home. I would be very happy to advise what to see or where to go to eat. I inherited the apartment from my grandparents, who, peering from the portraits, greet their guests from the door. We will be glad to welcome you in our house! Smart TV, Netflix, Spotify etc. The apartment was everything we needed for our 4 night stay. Tomasz organised our taxi from the airport and met us at the accommodation as agreed and all went smoothly. He showed us around the apartment and how everything worked and was very friendly and courteous. The location is superb and minutes from the main square and the restaurants and shops. Krakow is a beautiful city we fell in love with, and we only scratched the surface on our visit. We will definitely return soon!! The apartment and it location in the city were absolutely perfect. Tomasz was also very friendly and accommodating. The only major issue, as other reviewers have said, is the noise. There were a couple people partying in the courtyard unbelievably loudly until 4am one night and we lost an entire night of sleep. Honestly though, the place was fantastic and totally worth it. Right in city center where everything is happening! Very comfortable and enjoyable. Went back in afternoons for a nice break. Thank you for such a nice stay! The apartment was beautifully clean and well equipped, and very comfortable. 1 minutes stroll into the old square with restaurants close by. The owner was very helpful, and arranged taxis for us all to and from the airport . Very reasonably priced accommodation and well worth booking! This apartment is fantastic especially if you want a central location to make the most of your stay. It’s large, with two big bedrooms and a large sofa bed. The apartment is nicely presented and with excellent facilities - wifi, Netflix, good kitchen facilities (although no toaster!). The hosts were very friendly and helpful - the cherry vodka on arrival was a nice touch, as was the coffee which we needed after a long night travelling! The location is in the old town - 2 mins walk from the main square with lots of restaurants, 5 mins from the cathederal, 10 mins from the castle and 15 mins from the Jewish quarter - so everything is accessible. I would certainly stay again and would recommend to anyone.